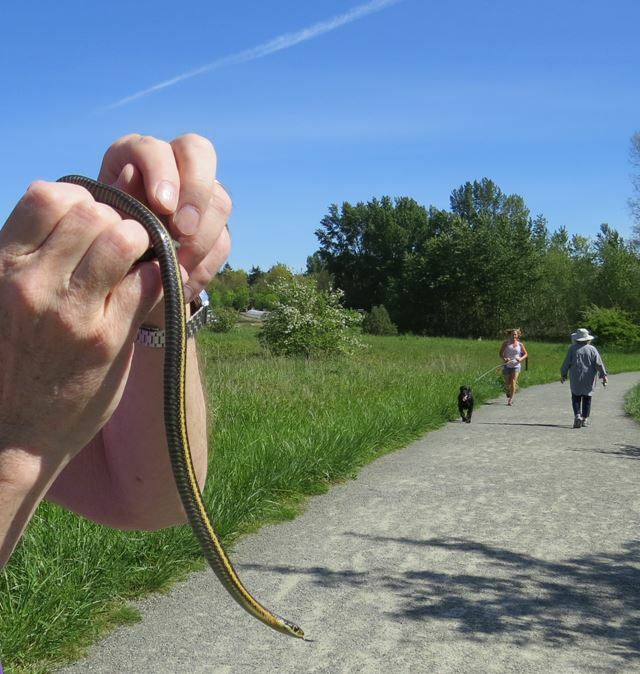 Nicholas Kristof wrote an opinion piece for the New York Times a few weeks ago titled: "Terrorists, bathtubs, and snakes." "In short, our brains are perfectly evolved for the Pleistocene, but are not as well suited for the risks we face today. If only climate change caused sharp increases in snake populations, then we’d be on top of the problem! ...Yet even if our brains sometimes mislead us, they also crown us with the capacity to recognize our flaws and rectify mistakes. So maybe we can adjust for our weaknesses in risk assessment — so that we confront the possible destruction of our planet as if it were every bit as ominous and urgent a threat as, say, a passing garter snake." Truth be told, none of our power sources are particularly hazardous when compared to common things like cars (one million deaths annually) and cigarettes (five million deaths annually). We wouldn't be debating the relative safety of wind, solar, hydro, and nuclear if it were not for the likes of, say, Greenpeace claiming that nuclear energy is too dangerous to use. When the Twin Towers were struck, we took our airlines offline, just as Japan did to its nuclear powerplants after the quake struck. However, our airlines were flying again in fairly short order (by the way, if you ever get the chance, go see the play Come From Away) and have been flying every since, while Japan's reactors largely still remain offline. Science aside, common sense strongly suggests that dumping this much carbon into the atmosphere, combined with ocean acidification, the destruction of old growth forests, peat, and grasslands, is a dangerous experiment. The greatest fear of climate skeptics is that the politics of climate change will wreak havoc on economies while at the same time fail to have any meaningful impact on climate change. There's growing evidence that the skeptics may have a point. The idea that wind and solar can do it all is a gamble we really should not take regarding our children's and grandchildren's futures. Nuclear energy will be a major part of the mix. The only real question is how much economic damage the anti-nuclear energy ideologues will wreak along the way. Thanks in large part to fear mongering from anti-nuclear energy groups, the combined economic losses as a result of taking their nuclear energy offline in Germany and Japan may approach a trillion dollars in the next decade. In addition, untold millions of extra tons of greenhouse gases are now in the atmosphere. The goal of a terrorist organization, as the name suggests, is to terrorize people to achieve some goal. But you don't have to use violence to frighten people. You can simply convince them that they are in imminent danger. There is only one reason Germany and Japan have taken their reactors offline--they have been convinced by somebody that it is dangerous and they are frightened. "...a 2002 review by the IAE [which] put together existing studies to compare fatalities per unit of power produced for several leading energy sources. The agency examined the life cycle of each fuel from extraction to post-use and included deaths from accidents as well as long-term exposure to emissions or radiation." Latent deaths are estimates from various sources of an increase in cancer mortality in old age in the decades following Chernobyl. For example, 4,000 people did not die of cancer in 1986. This is an estimate for a potential for that many to die of cancer over their lifetimes after exposure (out of the tens of millions who will die of cancer having no exposure), so the exact answer is unknowable but by looking at my spreadsheet it's pretty obvious that no matter what number of deaths and time interval you choose to believe, nuclear is one of the safest sources we have. Below I go on to demonstrate how, given all of this overwhelming evidence, Greenpeace continues to insist that "...nuclear energy probably still presents the largest risk to lives of the known energy technologies." So feel free to read on if you want to see a five-year-old Greenpeace article get peer reviewed. Back in 2011, Jan Beránek, head of Greenpeace International's antinuclear energy campaign, wrote a blog post in an attempt to counter articles like the one above from New Scientist that were appearing after the Fukushima triple meltdown. In the Greenpeace article, Beránek repeatedly links nuclear, one of the cleanest and safest sources of low carbon energy, to fossil fuels, calling it dirty, hazardous, and risky, examples of what Wikipedia calls "weasel words." "...as we actually can and need to get rid of both fossil and nuclear ...we need to get rid of dirty and risky energy sources, be it coal, oil, nuclear, or even gas ...making it clearly the most hazardous technology." Many readers will gloss over what is to them, the indecipherable head-ache inducing charts and focus on his concluding words, assuming that the charts back up the words, which, strangely enough, they don't. Not to mention, nuclear has no emissions and produces less volume of waste per unit energy than any other source, including wind and solar if you account for the huge amount of material per unit energy used in their construction. "In the debate about nuclear power, some people argue that the number of fatalities that can be attributed to the coal or gas industry is much higher than caused by nuclear power"
By "some people" he means "an army of researchers from around the globe" have found that fatalities (both latent and immediate) from coal dwarf that of nuclear, hydro, gas, wind, and solar combined. "– and conclude that this argument successfully makes the case for the continued use of nuclear reactors." This is his first strawman argument. There are many good arguments making the case for continued use of nuclear reactors other than the fact that they're more than a full order of magnitude safer than coal. "I find the discussion about which of the dirty technologies (as we actually can and need to get rid of both fossil and nuclear) is largest killer quite indecent and do not want to fuel it by throwing in more abstract figures that never respect the human lives behind them." Right ...indecent ...says the guy arguing that nuclear kills too many people to be safely used by posting two additional deaths per unit energy figures that "never respect the human lives behind them." "But for the purpose of getting some clarity around this argument, let’s look closer at those claims." 1) “Environmental and Health Impacts of Electricity Generation” published by International Energy Agency in 2002"
2) “Risks and Benefits of Nuclear Energy" published by Nuclear Energy Agency in 2007"
The arguments on fatalities from those papers have been frequently quoted elsewhere." For reasons I can only suspect, the author doesn't provide links to the study results which have been freely available on the internet for many years, so I have provided them above. "The first major problem with the fatalities argument that if one takes the effort to look closely, all the relevant figures and graphs in the OECD publications actually refer down to one single collective of authors, which is the Paul Scherer Institute in Switzerland." Except a word search on just the 4th source that he referenced (a 500 page document) finds the word "Scherer" a total of three times out of the over 400 references contained on 28 pages of references. I didn't bother looking at the other sources but you can bet the results will be similar. "Now, having such an important argument based on one single source is not exactly scientific, is it?" Not only are there many other studies and sources out there other than the ones referenced above, but these four studies are not by any means "based on one single source" anymore than natural evolution is based on a single source called Charles Darwin. "Let’s look further. Here one fancy version of their graphs, the one that has been reproduced in most influential International Energy Agency (IEA) paper, 'Energy Technology Perspectives 2008':"
"This chart [see Figure 3 and Figure 4]. plots frequency of accidents and their fatalities". It plots frequency of "events." But before I continue we need to define a few things to avoid confusion. See Table 2 below. "Accident, acute accident, and event" all mean the same thing in this article. 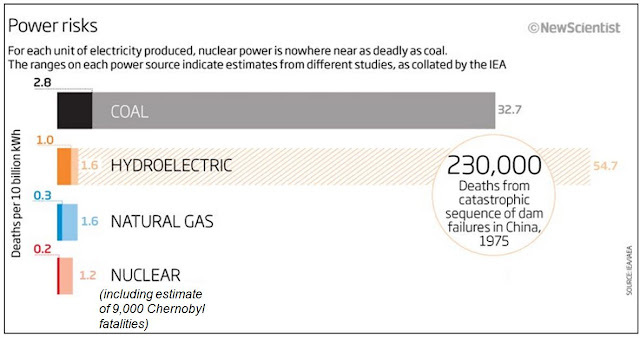 How frequent are nuclear powerplant events that result in fatalities? There is a total of one data point--Chernobyl, the poster child for how to do nuclear energy wrong. 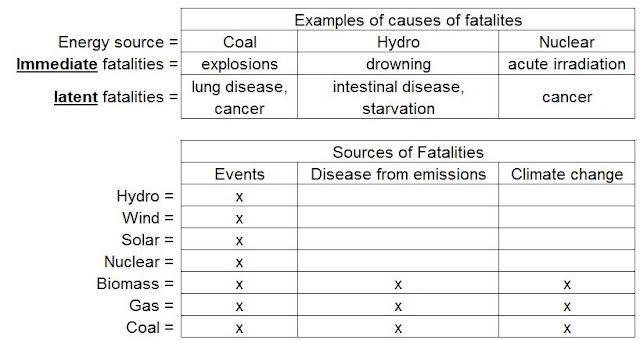 As I stated earlier, Figure 3 does not plot latent fatalities from coal's emissions, or the disease and starvation from the Chinese dam failure, but it does make an exception for nuclear by plotting not only the single event to result in fatalities, but also latent fatalities from Chernobyl, which still pale in comparison to immediate deaths caused by events from all other energy sources. "Therefore, the closer to the left bottom corner the technology appears, the safer it is – and vice versa, the more towards top right corner, the more risky." Interesting. I shaded his left-bottom and top-right quadrants above in Figure 3. 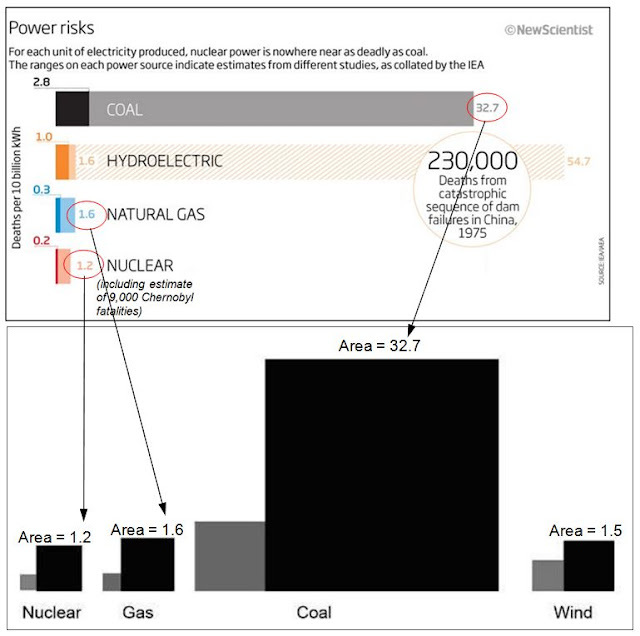 Note that coal isn't in his "risky" quadrant, and neither is nuclear, while hydro dominates it. To ice the cake, the nuclear immediate fatalities are found in his "safe" quadrant. "You need to note two things that are apparently wrong with this chart [see Figure 4]. First, it talks about the OECD – which allows authors to entirely exclude the worst nuclear accident- Chernobyl in 1986 - from the picture." There is nothing at all wrong with the chart he chose from the 4th study [see Figure 4]. Chernobyl isn't on it because the Soviet Union was not an OECD country. The chapter in the 4th study where the graphic is found (page 295) is about OECD nuclear, not world nuclear. 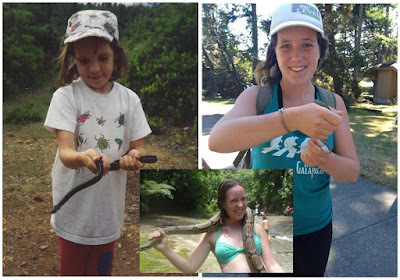 The 3rd study shows the whole picture as seen in Figure 3 above. And later I will show you that he was perfectly aware all along of Figure 3 found in the 3rd study. "If we were to plot Chernobyl, it would appear at the frequency of once in 8,000 GWy (accumulated nuclear generation history by now), and fatalities in the range between 9,000 (according to World Health Report (WHO) report in 2006, future victims in Russia, Byelorussia and Ukraine) and 33,000 (modest estimate of overall potential death toll based on collective dose, see for example TORCH report from 2006)." "The graph would then actually look like this [see Figure 4], with the red bar showing more realistic range for nuclear power’s record, making it clearly the most hazardous technology:"
Clearly the most hazardous technology? Again, note that nuclear "immediate" fatalities fall in what he thinks is the "safest" quadrant (see Figure 3, graph (b) non-OECD). 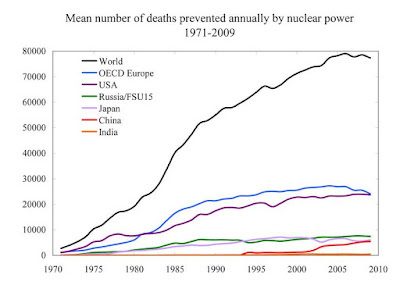 Nuclear "latent" fatalities are in neither quadrant and clearly have far fewer total deaths than any other source. 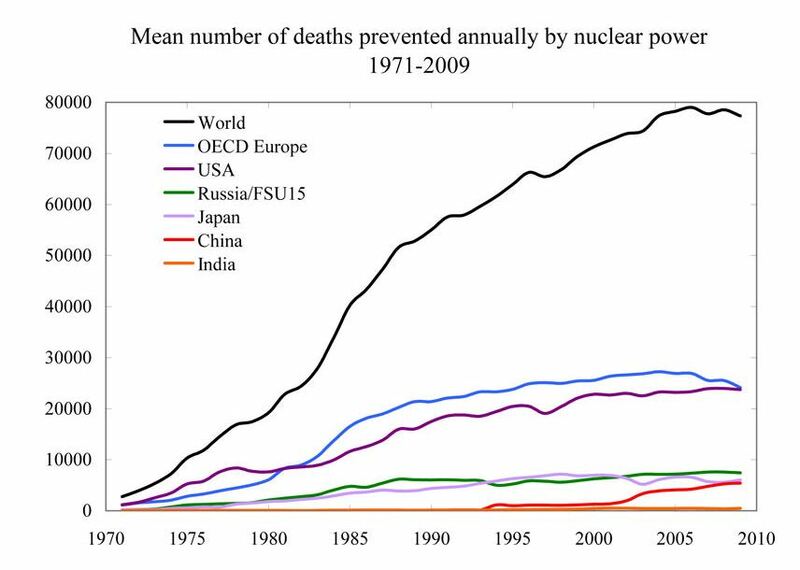 The authors went to the trouble of plotting latent fatalities for nuclear in addition to immediate ones, generously including not only the estimate of 9,000 future potential deaths, but also the results from two anti-nuclear energy researchers hired by the German Green Party (the TORCH report) to counter the WHO report. 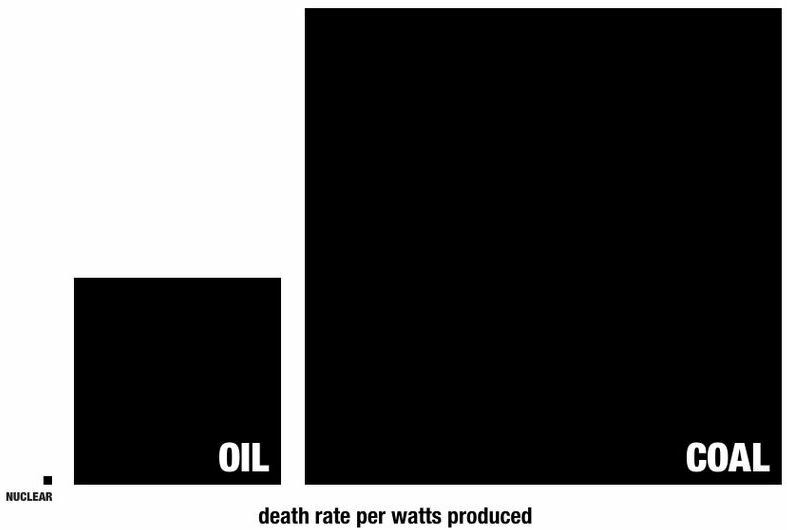 Had they plotted latent fatalities (cancers, respiratory illness etc) for coal, the results would have required an entire new graph because of the huge scale difference. I created just such a graph in Figure 10. "The second thing that is terribly wrong with the original chart, is that while it pretends to include nuclear power, it is using double standards to plot it. Contrary to other technologies, where the risks are taken from real world experience, nuclear risks are based on PSA." Wrong again. The PSA data only exists in graph (a) of Figure 3 for the OECD countries because there is no "real world experience" to plot. It was generous of the researchers to go to the trouble to plot PSA for nuclear graph (a) of Figure 3 considering that they had no real world data to plot. 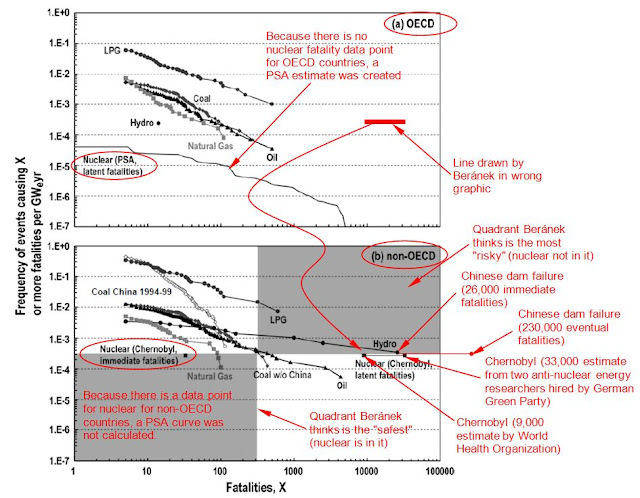 Note that there is no PSA plot in graph (b) of Figure 3 for the non-OECD countries because there is a single "real world experience" for nuclear. "This is so-called Probabilistic Safety Analysis and is nothing more than a theoretical modeling of reactor risks. It is acknowledged as a method to identify weak points in the technology, but even the nuclear industry says it is not good tool for coming up with reliable figure (sic) of the overall chance of heavy reactor accident." "We have seen this method going totally wrong in the case of the US Space Shuttle program, where the engineers estimated a chance of accident as 1 in 100,000 but in fact two of the four Shuttles in the fleet ended up meeting disaster (a great insight by Richard Feynmann can be found here)." Never assume readers will not follow a link. His link actually says that engineers assigned a range of 1 in 100. The 1 in 100,000 value for the Shuttle (not nuclear power) according to his link, ostensibly came from managers, not engineers. If anyone had asked this engineer (me), I'd have told them that rocket ships are no place for civilian school teachers. And we now have a new data point called Fukushima, which demonstrates that a triple meltdown in a modern reactor as opposed to the now extinct primitive Soviet era design, is a non-fatal event. And many European reactors are even safer than those in Japan, some having radiation filters in their vent systems. "We can also see how wrong this method went for the nuclear power sector globally: while the industry is assuring us that the chance of a heavy accident involving reactor damage is in the order of 1 in 100,000 years"
Where he got that 1 in 100,000 years number, he didn't say. Is he confusing the 1-100,000 flights estimate that was ostensibly quoted by unnamed managers for the Space Shuttle in his link? "...in fact we have seen at least five such accident s (one reactor at Three Mile Island in 1979, one reactor at Chernobyl in 1986, and three reactors at Fukushima in 2011) during an accumulated 14,000 reactor-years of experience – this brings the empirical figure of more than 1 in 3,000 chance. Nevertheless, OECD publications use this theoretical calculation, done for a single Swiss reactor (sic! ), to make generic conclusions on hazards." Translation: In over half of a century of generating electricity with nuclear power, there have only been three reactor events of note, and only one, a primitive, now extinct, cold war Soviet era design, caused any fatalities, with an estimated total potential (spread out over the next several decades) to kill less than a percent of the annual death toll on roads. Fukushima demonstrated that modern designs experiencing triple core meltdowns in the middle of magnitude nine quakes and 60 foot high tsunamis don't result in fatalities. "This is already a third major methodological mistake that makes the original IEA charts figures (sic) heavily biased and unreliable." There is no methodological mistake, as I explained above. I'm trying to keep a straight face here. Greenpeace charts and figures are not heavily biased and unreliable? 1) Take your data from one single institute in all publications (there is a lot of referring in circles but finally it all ends up with the Paul Scherer Institute)"
As I stated before, that isn't true. A word search on that 500 page 4th source that he referenced finds the word "Scherer" a total of three times out of the over 400 references contained on 28 pages of references. "2) Ensure sure (sic) you find a methodology that allows you to exclude the worst nuclear disaster in the history from your statistics (such as talking about OECD only)"
"3) Use double standards in comparing technologies (theoretical modeling for nuclear versus historical record for other technologies)." Except, there were no double standards. As I said above, the PSA data only exists in graph (a) of Figure 3 for the OECD countries because there is no "real world experience" to plot. It was generous of the researchers to put any nuclear data at all in plot (a) of Figure 3. Note that there is no PSA graph in graph (b) of Figure 3 for the non-OECD countries because there is a single "real world experience" for nuclear. "While if plotted properly, you will find out that nuclear energy probably still presents the largest risk to lives of the known energy technologies." The proper plotting existed all along (see Figure 3) For reasons I can only suspect, Beránek chose not to show it and clearly, nuclear presents one of the smallest risk to lives. There is no evidence presented above to suggest that nuclear is "the largest risk to lives of the known energy technologies." Even the antinuclear energy blogger Joe Romm said "There is no question, nothing is worse than fossil fuels for killing people." "But there is also an important qualitative difference here." "If we talk about accidents in the coal or oil industries, those risking their lives are mostly workers directly involved in the operation." "More than half of all deaths stem from uranium mining." And those few uranium mining deaths occurred in the early days before safety regulations to make nuclear weapons to close the cold war missile gap. Only ~ 40-50 people were directly killed by the only nuclear event that has resulted in fatalities (Chernobyl) in over a half century of operation ...on the entire planet. "In that sense, it is certainly their choice by choosing the job and they also have the means to mitigate and control the risks they are taking." Above, Beránek displays a stunning level of naiveté. Coal miners don't mine coal because they like working miles underground in dark, filthy, dangerous, back-breaking conditions. They would much rather sit in front of a computer and write fairy tales for Greenpeace if they could. But cushy jobs like that are rare as hen's teeth. They mine coal to feed themselves and their families. "In the case of nuclear power, most of the risk is imposed on a population that has no information, no expertise, no training, and most importantly no choice as they are denied from having the power to decide if they want a nuclear reactor in their vicinity." "Apart from the International Energy Agency, more graphs and figures have been appearing widely, such as this one:"
Figure 5 The above graphic shown in the Greenpeace blog was created by Seth Godin in a blog Titled "The triumph of coal marketing." He used the old data from the original Next Big Future blog and I checked to see if his squares matched the data. The only thing he got wrong is the word "watts" in the title. He should have used "watt-hours." 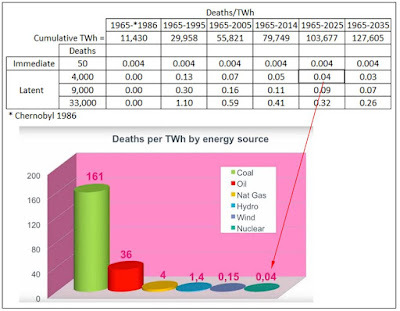 The Next Big Future link contains an update to the original data as well as the old data where the 160 deaths/TWh number was split into 100/TWh for electricity, heating, and cooking –world average, and 60/TWh for just electricity-world average. "This is coming from yet another angle, which is not only looking at fatalities from accidents but also the health impacts of routine air pollution etc. That this approach gives even much more space for voluntary speculation, it can be illustrated by how much the figures differ if they come from different sources." 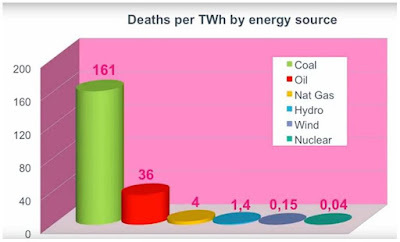 "Take for example the above mentioned blog and source data for those impressive boxes: they attribute 161 fatalities per one TWh (billion kilowatt hours) of electricity to coal, 36 fatalities per 1 TWh to oil, 4 fatalities per TWh for natural gas, and 0.04 fatalities per TWh to nuclear. That would indicate that nuclear is at least by three magnitudes (1,000 times) safer than fossil fuels." Why all of the words? Why he didn't simply show readers a graph of that data found on the Next Big Future blog post, of which several versions can be found all over the internet, I can only suspect. So I provide a version for you in Figure 6. My guess is that he didn't want to highlight the relative safety records of nuclear (immediate and latent fatalities), hydro (immediate fatalities), wind, and solar. And if we were to account for the estimated 1.84 million lives saved by nuclear displacing coal over the last half century ...enough said. "Contrary to that [see Figure 8], New Scientist comes up with figures that still suggest fossil fuels are bigger killers, but the contrast with nuclear is by far less impressive." "The nuclear figures seem to be in line with what the International Energy Agency reported in 2002, that is, routine nuclear power related fatalities to be in the range of 0.03 and 0.16 fatalities per TWh [comparing the New Scientist numbers when converted from deaths/ten billion KWh to deaths/TWh =0.02 and 0.12 fatalities per TWh] only due to health impacts related to uranium mining – even if we simply forget about reactor accidents including Chernobyl." "So the more proper illustration comparing health and death impacts of energy sources – that is if we skip accidents such as the only accident involving fatalities which was Chernobyl and only talk about standard operation [don't include the millions of deaths caused by coal emissions]..."
Same problem. The New Scientist article did not skip Chernobyl, and neither did the Next Big Future article, ergo, neither did Beránek's own graphic below in Figure 9. 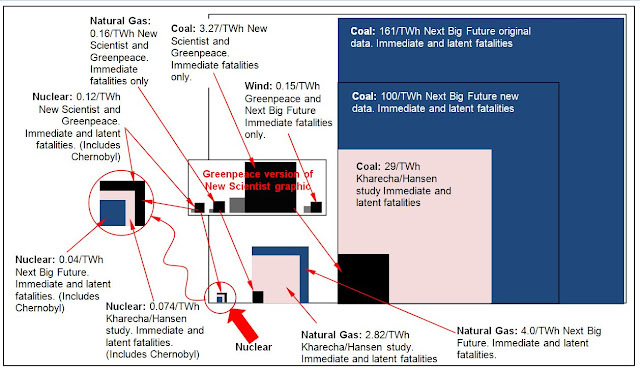 "– would rather look like this (grey and black squares representing the range):"
"And yes, there is no doubt that for various reasons – including the related fatalities but much beyond – we need to get rid of dirty and risky [weasel words] energy sources, be it coal, oil, nuclear, or even gas." Then we need to also get rid of wind, and hydro, which, according to Beránek's own graphic and New Scientist, are both riskier than nuclear. He describes nuclear as dirty more than once. I guess he needs to define dirty for us because it has no emissions and less volume of waste per unit energy produced than any other source, including wind and solar if you account for the huge amount of material per unit of energy produced used to construct them. "The future is with renewable energy technologies which have economic, safety, security of supply, as well as sustainability advantages over fossil and nuclear energy." "The fatalities ratio is no differently in clear favour of renewables". Above, I think he is trying to say that the fatalities ratio clearly favors renewables over nuclear, which clearly, it doesn't. "The wind power fatalities per unit of energy was reported to be twice as that of nuclear in Germany in 2000 (IEA 2002). In this chart above, we use the figure of 0.15 per TWh copied from the Next Big Future blog. It is probably safe to assume that in past decade, due to significant upscaling of energy output per one wind turbine, as well as maturing of the technology, the fatality ratio has substantially further decreased." Greenpeace doesn't get everything wrong of course. They are also against the use of trees to fuel powerplants. It is time to stop harvesting whales. But when it comes to nuclear energy, they really can't be trusted, as the above peer review attests. Greenpeace is first, and foremost, an anti-nuclear energy organization. It's what they do. It is not an engineering research team. Google once assembled such a team which concluded that renewables alone will barely scratch the surface. Assuming humanity is capable of reining in climate change, you sure don't want Greenpeace telling us how to do it. In fact, when you look at the huge backward steps taken by Japan and Germany with regards to emissions reductions, Greenpeace has become one of the stumbling blocks to fighting climate change. They are quite simply more concerned about the minuscule risks posed by nuclear energy than they are about climate change.